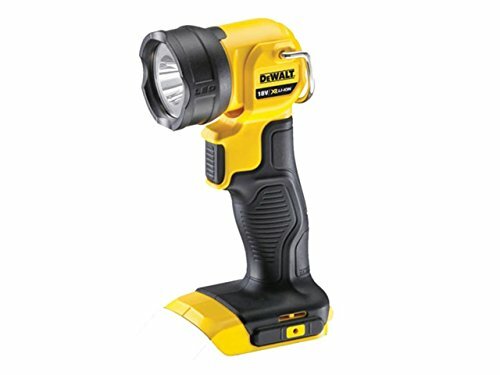 The DEWALT DCL040 is the latest generation 18 Volt Work Light, using LED Technology and featuring new XR Li-Ion technology. It has a compact, lightweight design with impact resistant housing and improved ergonomic design and rubber grip increase comfort. The LED Bulb producing 110 Lumen output (10,000Hr Life) with a 2 zone light pattern with the flashlight head pivots more than 90 degrees vertically with ratchet lock. The Flashlight includes an integrated hook for hanging and can be used free standing, with belt clip. Please sign-in or register to write a review about this product. Please sign-in or register to contact us about this product. Or, call us on 0844 335 1262.